As you might have guessed from the name of my blog, ‘A Girl Has to Eat’, I am a firm believer that a girl has to eat. And it’s not because I’m trying to be exclusionary when it comes to boys, for I rather like boys. I like boys a lot. Past about the age of 13 (oh alright then, 12) when I kinda started getting use to them pulling my ponytail and yanking at my skirt, I sorta came to realise they weren’t ALWAYS so annoying after all. Lantana, not just eggs, bacon and chips. So the story goes about a girl from Melbourne who traversed the continents to show Londoners there is breakfast beyond the bacon sandwich, and then she blogged about it. Seriously, it’s called scrambling eggs, and she has affectionately named the café after an Australian ‘weed of national significance’. In the six months it’s been around, Lantana has bloomed into a significant café and now boasts a loyal following. I’m an avid follower of Shelagh’s blog and I really do admire her work. As usual, I’m late to the party. I first came across Lantana on the food blog worldfoodieguide and completely fell in love with the idea of it. Awesome cafés are hard to come by, awesome cafes with great back stories are even harder to come by. Somehow I managed to get Friday off work. I thought about it – The Wolseley, I mean. I believe they’ve perfected the Arnold Bennett you know. Just thinking about the rich cheese had me salivating. Then again, I just couldn’t help but recount the Lantana story, and I’m a completely hopeless one with these things. And so it was my decision to swap Green Park glitz for a soulful Australian café. Just off Goodge Street station, it’s buried curiously deep within Charlotte’s place. Through the doors and into a rather cosy room, simply decorated with plain walls and it looks like twenty warm bodies can fit. It was bustling when I arrived and the café was completely packed out. I managed to wrestle a table for myself, whipped out my Times and tucked into my flat white. The menu is scribbled on the wall behind the counter and the capable breakfast menu featured corn fritters, eggs (your choice) and toasted banana. 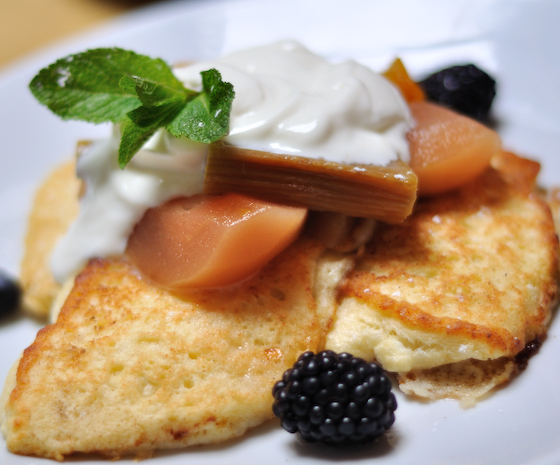 I don’t think I spotted a Full English, but the ricotta pancakes, with baked fruits and yogurt (£6.50) caught my eye. In spite of the crowd, food still flew out of the kitchen rather breezily and I was mightily hungry when they brought out the heavenly looking pancakes. When I first started food blogging, I was channeling the M&S adverts a lot. I mean I really wanted to share all the sensations I felt when I came across great food. And believe me, putting taste into words isn’t always quite so straightforward. This however, was one of those moments where I had to channel the M&S baritone. The texture was fluffy like a pillow, the rising steam fogged up my view and gave it this surrealistic feel, and suddenly I was recounting the first time I ate pancakes. The pancakes had a hint of butter to its flavour but I knew I caught on to a winner when I took a bite out of the warm pears & figs. The fruits, baked, were luscious, and the sweetness was intensified with its warm temperature and was just oh so soft. The cool yogurt cut through the sweetness and provided a nice contrast to the fruit. I felt comfortable with this, and for a short moment, I was ten years old again and splurging far too much maple syrup on my pancakes. By the way, coffee is excellent. My flat white was a smooth flowing foam for froth, and the coffee itself was quite intense, with just a hint of chocolate in the aftertaste. 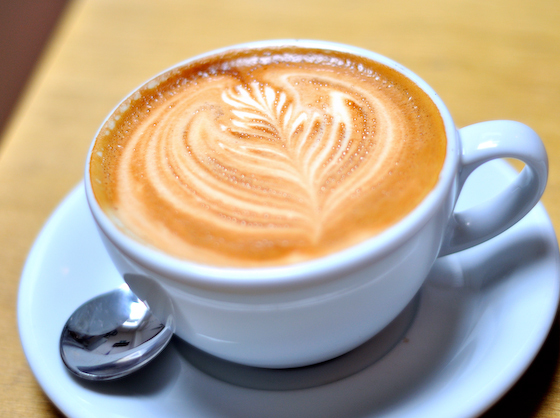 If there’s one thing that makes (or breaks) my day, it’s a damn good coffee, and I think these are pretty robust at Lantana, as good as the flat whites served at the Café Flat White in Soho. Well, that’s my excuse for eating way too much anyway. 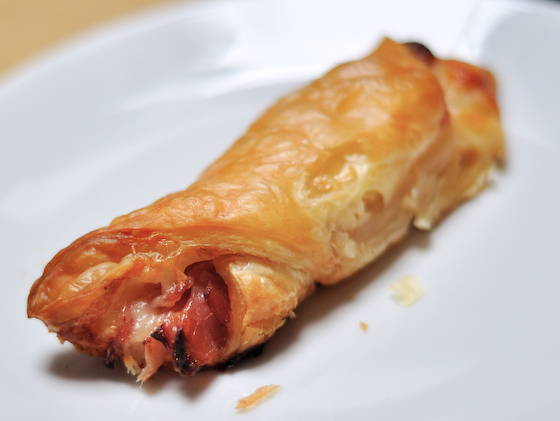 I love a good ham and cheese pastry in the morning and these little sticks were really appetising. I wanted to have a couple more but they sold out. Bearing in mind, this was half an hour after they opened the shop at eight. 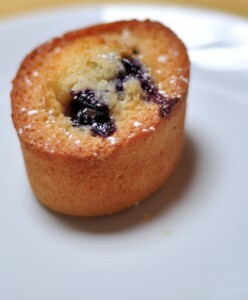 I decided to end my meal on a sweet note with a classic Australian friand – blueberry flavour. A lovingly baked sponge, it was fairly dense, but very moist, and the slight sugary edge left me with a peaceful smile as I finished my coffee. Ah… don’t you just love a good breakfast? All in all, I enjoyed my breakfast at Lantana. Shelagh set out to improve the breakkie in Britain, and I think she’s created a great little eatery that’s bound to please crowds. I hear great things about the lunch options and I’ll have to pop back in again to check it out, but for now, I am glad that London has another great café which is all heart & soul and exactly what food is all about. Verdict: It’s a great little Australian café serving great food with lots of character; don’t forget to read the blog behind the café too. Sounds like a perfect breakfast! Perhaps I should try breakfast instead – I came here yesterday for lunch with high hopes and found the food to be quite average and over-priced. If only I didn’t live 12,000 km away…I’ve been looking for interesting ways to vary breakfast lately, and this would definitely do the trick. My goodness, your descriptions are delicious and your photos make me shiver pleasurably all over. Too bad I live in New York because I’d be at Lantana in a heart beat. great guest post Kang! as a breakfast-fiend who has breakfasts for all three meals sometimes, I am DROOLIN like crazy. love those fluffy ricotta pancakes…they look so luscious! almost like omelets!